Roast Beef Fillet in my opinion must be served rare. I don’t even mind if it is blue, but it must be warm in the centre. This roast beef was cooked to perfection and served with a truffle and mushroom sauce. Remember to rest before slicing and serving. I so agree about cooking it rare. If it’s good meat, just being warm in the middle is good enough for me. Love to know more about that sauce. 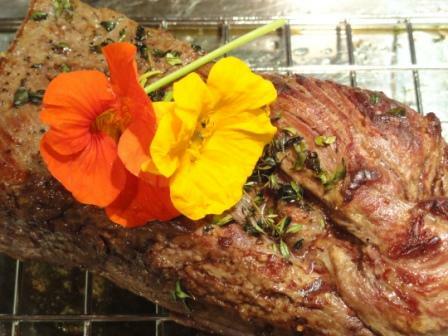 Mmmm – Tandy – I love roast beef and this cut definitely needs to be served rare. Your truffle and mushroom sauce sounds great. Have a lovely afternoon Tandy.